To its credit, Photoshop lets you establish a new layer in roughly a billion ways. If you want to add a selected portion of one image to another image, the easiest method is to Ctrl-drag the selection and drop it into its new home, as demonstrated in Figure 12-2. Photoshop makes you a new layer, lickety-split. Figure 12-2: Ctrl-drag a selection and drop it into a different image window to introduce the selection as a new layer. 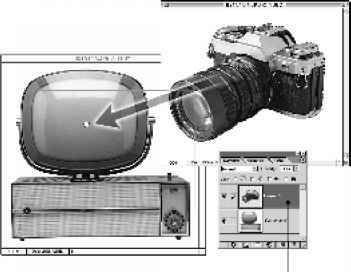 As you can see in the Layers palette, the camera becomes a new layer in front of the television. Be sure to Ctrl-drag or use the move tool. If you merely drag the selection with the marquee, lasso, or wand, you drop an empty selection outline into the new image window. Also, be aware that pressing Ctrl delivers the move tool. But if the pen, arrow, or shape tool is active, you get the arrow tool instead, which won't work for you. Press M to get the good old marquee tool, and then try Ctrl-dragging again. When you drop the selection, your selection outline disappears. Not to worry, though. 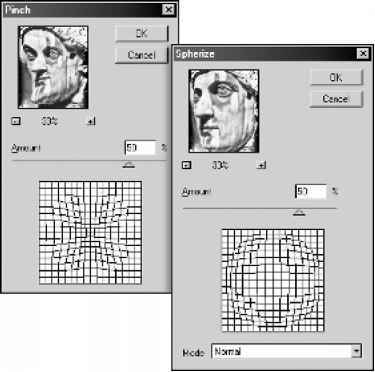 Now that the image resides on an independent layer, the selection outline is no longer needed. You can move the layer using the move tool, as you would move a selection. You can even paint inside what was once the selection by selecting the first of the Lock check boxes in the Layers palette. I explain both the move tool and the Lock check boxes in greater detail throughout this chapter. If you want to clone a selection to a new layer inside the same image window — useful when performing complex filter routines and color corrections — choose Layer ^ New ^ Layer Via Copy. Or press Ctrl+J, as in Jump.